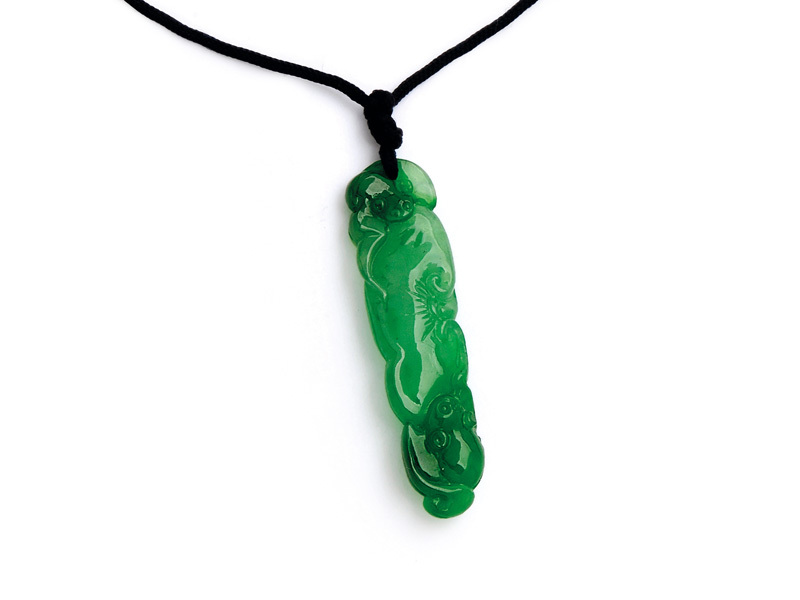 Elongated jadeite plaque pendant depicting the symbolic ‘Mushroom of Immortality’ motif carved as a pair of bats amidst lingzhi mushrooms. ‘Icy,’ ‘mottled,’ ‘mutton-fat,’ ‘greasy’. No, your freezer doesn’t need defrosting, there’s been no kitchen disaster, and this is not about the newest trend in restaurant menus or avant-garde ice cream concoctions. These are some of the myriad terms describing a mineral venerated in Chinese culture. Chunks of this silicate rock have been used for thousands of years for ornamental and household purposes. The finest qualities of this ‘Stone of Heaven’ have long been synonymous with the very word for jewel. Beloved of emperors and courtesans alike, jade was reserved only for the wealthiest individuals at court at one time. Specific motifs were carved into the stone representing longevity, wealth, health, and wisdom. Typical examples include the bat, a symbol of happiness and longevity, and a species of mushroom, the lingzhi fungus, representing immortality. Beautiful, inspirational forms include: lotus blossoms, lily pad leaves, bamboo, chrysanthemum blossoms, melons, peaches, cranes, fish, and the famed Foo Dog, a cross between a dog and a lion. Mythological dragons and the phoenix are also popular depictions. 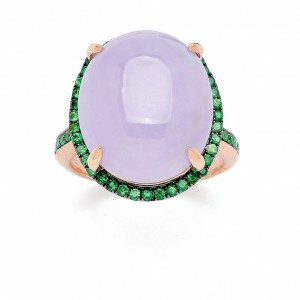 A lavender jadeite cabochon ring, with contrasting deep-green tsavorite garnet trim. would be set carved or cabochon, often with diamond details. Renowned jewellers like Tiffany & Co., Cartier, Van Cleef & Arpels, Janesich, Chaumet, Lacloche Freres, Boucheron, Garrard, and David Webb have made imaginative use of jade. Elsa Peretti created a collection of bean-shaped cufflinks and pendants in varicoloured jade for Tiffany & Co.
Why is one piece of jade priced at $2000 and another worth up to 100 times as much? Optimal quality and pricing are dependent on various criteria, including translucency, colour shade, saturation, and uniformity. Thickness, size, shape, symmetry, and surface texture are also taken into consideration. Excellent translucency or semi-transparency is most desirable‚Äîthe finest jade seems to glow from within, almost with a vivid force that’s otherworldly. Intensity of colour and its overall distribution, as opposed to a variegated pattern such as what’s known in the trade as mottled, are another pricing factor. Different shades of green have different values, too. In descending order, we have imperial jade, kingfisher jade, apple jade, and moss-in-snow jade. Some markets prefer whites and lavenders. Specialty gemmological laboratories in Hong Kong are set up to certify jadeite jade and if a reputable lab states natural jadeite, no resin or dye found, it reassures the potential buyer there’s no detectable indication of any material or colour enhancement. Platinum and 18-karat gold art deco jabot pin circa 1920s, with a vase motif set with round diamonds and black enamel trim. The carved jadeite plaque depicts fruits amid foliage. The band of polished to gem-quality jade, termed a ‘hololith,’ is a common design element symbolizing eternity. This is typically carved from a single solid piece of rough boulder jade. A flattened disc with a central hole is called a ‘bi,’ and is popular with both sexes, while bangles are given to girls and saddle or circular rings to boys. Traditionally, these items are believed to promote protection and also increase the status and prestige of the parents. Occasionally, you’ll see what was formerly a solid bangle that’s been shattered, broken, and split apart into a few pieces, the curved remnants cobbled together with ingenious bands of gold hinges hiding the breaks. There’s always been a healthy market for jade in Hong Kong, but recently it’s collectors from mainland China who are driving up the prices. At auction, some hammer prices are doubling, tripling, and even quadrupling the initial estimates. Most of the world’s supply comes from Myanmar and last year Bloomberg Business News reported sales from jade generated more than $2 billion in revenue for the government. A giant stone was unearthed earlier this year in northern Myanmar and at the time it was reported to be a jade boulder weighing approximately 50 tonnes, but the story remains unverified due to the region’s political instability. The 2008 U.S. embargo against the importation of the stone affected the available quantities and pricing. A jadeite bead necklace with a ruby clasp from Cartier sold this year for $27.4 million, breaking all former price records for jade jewellery. The Hutton-Mdivani necklace was once owned by American socialite Barbara Hutton, the heiress of the Woolworth five-and-dime store fortune. Its 27 perfectly round beads of exceptional quality and colour measure from 15.40 to 19.20 mm, and are worth an astounding million dollars each! 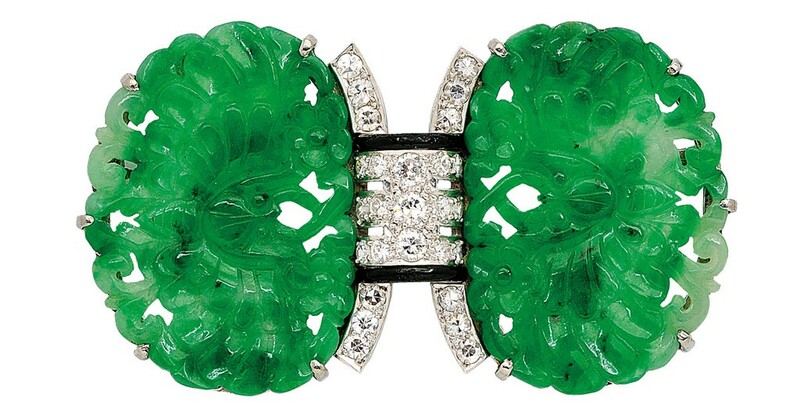 Platinum and 18-karat gold art deco brooch with jadeite plaques carved as a pair of butterflies amongst flowers, centring a diamond-set arch accented by black enamel. There’s no reason to be jaded about jade–it comes in a myriad choice of colours, shapes, qualities, and prices. Cool to the touch at first and gradually warming to body temperature, there’s pleasure for all the senses. And buying jadeite might make economic sense too, since there’s always a possibility that if items continue to be purchased for investment purposes, prices can continue to rise, as supplies of the raw gem are certainly not infinite. Or that’s the hope of various collectors, since there’s no embargo on coveting a fine piece.